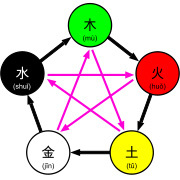 The main Chinese elements are five and consists of fire, earth, water, metal and wood. They can be destructive as they are creative. Water isn't considered to be an element in Chinese astrology, which is different from Western astrology. In addition Metal and Wood are considered to be the main elements. Each element has got positive and negative aspects to be balanced individually. As for drinking water has positive features and it gives life, but it has negative featires for making flood and a storm. All elements have been given such features. This fivefold element structure takes its origin from Taoizm. Probably in the II century A.D. Taoizm became religion, and it is connected with the witchcraft,immortality and other extraordinary beliefs which were come across in Ancient China. Taoists accepted philosopher Lao Zi as a great master and Dao Da Jing (ultimate guide and its power) as a secret book. They interpreted the philosophycal meaning of "Dao" mysteriously and claimed that the human being could reach the immortality, bounding and educating himself with "Dao" which was defined in Dao Da Jing.